Homemade Natural Shimmering Lip Balm feels so good on your lips! Toss out unhealthy commercial lip Balms and make your own. This recipe is easy to make, cost-effective, and It makes great gifts! My friend Bonnie, invited me down to her lovely home recently. We had a cozy mom chat about a certain wedding in our future. Then we got down to work. Bonnie made a marathon THREE recipes all in one afternoon while I documented the process! I had such a good time with her! Watch Bonnie make this incredibly easy recipe in her own kitchen. The How to Video you see above is my very first attempt to “live video”. I promise to keep improving my video skills in the future. The video teaches the process. It’s so easy to make these lip balms! You only see Bonnie actually adding in cocoa powder for color in the video. That is because your newbie videographer is guilty of having a really great time with Bonnie. Consequently, pieces of the raw (rather shaky)video had to be scrapped. Bonnie does begin with the Mica for the shimmering effect and the lightest rose tone. She added the cocoa powder to create all the increasingly darker color variations you see below. Bonnie even did a few clear lip balms to show you no color is needed at all (unless you want the shimmer). This is my third, and sadly, last recipe of the DIY skin care recipes from my friend, and soon to be fellow Parent in Law, Bonnie. If you missed our back story and Bonnie’s Healing Hand Scrub and Homemade Healing Ointment recipes , click the links to find those posts. All three of these skin care recipes are in my bathroom. I keep this Homemade Natural Shimmering lip balm in my pocket and use it daily. I have given some to my mom and my daughters. We all adore this lip balm! Excellent skin care recipes like these, made from organic ingredients, easily, right in the kitchen! Doesn’t get much better than that! Homemade Natural Shimmering lip Balm feels so good on the lips! Of all the recipes Bonnie made, this one is my favorite. I love lip gloss! When I first met Bonnie she opened her purse, pulled out Natural Shimmering Lip Balm and gifted me with a tube. I was immediately entranced! Until I met Bonnie I had never known anyone who actually made their own lip balm. I am ordering the ingredients soon so I can make my own. I want to stock up and make my own personal gifts! Nowadays I’m using lip balm instead of lipstick, like I used to. When my oldest granddaughter was born I babysat her. She was so precious I just kissed her all the time 🙂 And left huge red marks all over her beautiful face! 🙁 Horrified; I tried to wipe it off. By day’s end suspicious Red smudges, that I could NOT remove, marred her perfect baby face. Her parents gave me ‘The Look!’…OFTEN!… I finally took the hint. Goodbye lip color, Hello clear chap stick. I could never give up baby kisses. Homemade Natural Shimmering Lip Balm is Long lasting, soothing to the lips and feels really good. It’s very pretty with a bit of shimmer from the mica powder. This lip balm offers Wind protection and moisturizing properties. It feels great on the lips and it’s made from All healthy natural ingredients. This is a FANTASTIC gift idea! To begin: Here is what you will need! I am including the Amazon Affiliate Links to the products Bonnie used for your convenience. She ordered everything she needed from Amazon. Slice of the moon Colored Cosmetic Mica (Bonnie used the Rose Red Metallic powder. Choose any color you prefer). The organic coconut oil and cocoa powder should be available nowadays in your local grocery store or, of course, you can order them easily from Amazon as well. 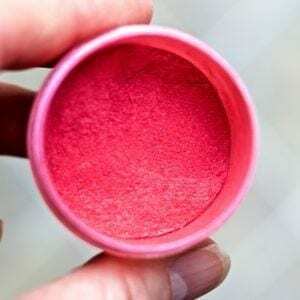 Rose Mica for coloring the natural shimmering lip balm. The Mica is what gives the balm it’s shimmer! Here is the Rose colored Mica Bonnie used to color her lip Balm. These ingredients are necessary to make a lovely batch of naturally healthy lip balm. Lip Balm Tubes come in either clear or white caps. These tubes work really well. I am impressed how well they hold up with constant use. Several of these tubes of lip balm survived hard use at my hands. Bonnie is Mixing the Mica and Cocoa powder into her Lip balm base to deepen the Rose Mica color. She made several shades of lip balm. Melt the beeswax and Shea Butter together on low heat. Do not burn! Notice Bonnie uses a pan on the stove and inserts her 2 cup glass measure right into the pan of hot water. Then she stirs until it melts and removes from heat. (a double boiler might work as well) Reheat as often as necessary until all the lip balm tubes are filled. Once the lip balm base is melted, Remove from heat. Add vitamin E oil and peppermint drops. Adjust the color this way. Start with the clear lip balm, if you wish to make some clear. Use the pipette to insert the clear liquid balm into your lip balm tubes. Make sure you completely fill the tubes with no air bubbles. When you have all the clear lip balm tubes filled set them aside to cool and harden. Now add your preferred color shade of Mica to the warm liquid clear base about 1 tsp at a time until you like the shade. (rewarm the base if necessary to keep the recipe pourable.). Many shades of lip balm can be attained by making the different shades in batches. Intensify the colors of each batch by adding 1 tsp. cocoa powder, or more, as you prefer. Lip balm Tubes Loaded with natural shimmering lip balm. When set place the caps on and store for future use! NOTE: You will go through a lot of pipettes. The lip balm cools and hardens quickly in the tubes. So you may need several pipettes to complete a whole batch of fourteen differently colored lip balm tubes. 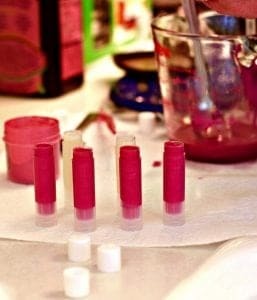 Use the pipettes to load the tubes with the colored, or clear, lip balm when the lip balm is still liquid and pourable. Rewarm the lip balm base as necessary to keep it easy to work with. Set your lip balm tubes on a paper towel to cool and set. About 30 minutes. Cap the tubes and store at room temperature. I found these lip balms wonderfully durable. I kept mine in my pants pockets and they remained stable at body temperature. No icky melty consistency or messy color smudging either! Natural Shimmering Lip Balm is beautiful, easy to make and makes lovely gifts. The more tubes of lip balm you make the cheaper this recipe gets per tube! 1 1/2 teaspoons of rose mica. Adjust the color this way. Start with the clear lip balm, if you wish to make some. Use the pipette to insert the liquid balm into your lip balm tubes. Make sure you completely fill the tubes with no air bubbles. Now add your preferred color of Mica to the warm liquid clear base(rewarm the base if necessary to keep the recipe pourable.). Many shades can be attained by making the different shades in batches. Intensify the colors of each batch by adding cocoa powder as you prefer. When the entire batch is made let it set until hard, about 30 minutes. Cap the tubes and store at room temperature. This recipe makes about 14 tubes of lip gloss. Hi, I’m confused about the cocoa powder. What kind are you using? I used only the mica powder and the color is great in the tube but when I put it on it is almost clear. Is that because I didn’t mix it enough or because I didn’t use the cocoa powder? Any suggestions would be helpful. Hi Staci, I took a picture of the ingredients for you. It’s on the post. The cocoa powder Bonnie uses is Trader Joe’s unsweetened cocoa powder. If you don’t use any cocoa powder the color will be more transparent. The cocoa powder adds depth and opaqueness to the color so it’s more visible. Lip gloss is not like lipstick. The color is more of a sheen than a full cover.You might try a deeper color of the mica powder too. Bonnie choose a nice mid range rose color. But if you prefer choose a browner mica or a deeper red. Hi i made this and it’s aweome! I was wondering how long it lasts and do i need to keep in fridge? I don’t want it to mold. Thank you! Hi Carmen, Aren’t these fantastic?? No need to keep them chilled. They are stable for MONTHS and maybe longer at room temperature. Of course, they may melt over 80 degrees. I have given these to my daughters and Bonnie has given these as gifts for years. They just need a place in your cupboard where they won’t get lost. Enjoy! Coco powder is water soluble, not oil soluble! It won’t diperse in an oil based formulation, you will get some unpleasntly clumpy lip balm. So go for it with the mica, but it’s a no-go on the cocoa powder. Otherwise the recipe looks fine. Thanks for stopping by with your input. Our experience differs with yours. We have no trouble with clumping. Maybe the brand Bonnie used was just the right consistency? I’m not sure. But I have used this lip balm personally and so have my daughters and many of Bonnie’s friends for years with no trouble. And there is no clumping in the pipettes when it’s made either. I’m glad you brought this up. But I can’t say it’s a problem with this recipe. how fun to make your own shimmering lip balm! The colors you made are very pretty too! Thank you Gaye, I love this lip balm!